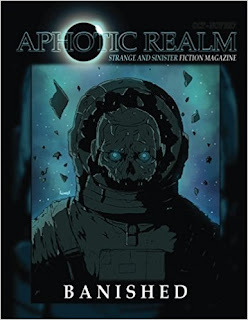 To celebrate the launch of Aphotic Realms second issue; Banished I 'm talking to Gary Buller one of the many uber talented authors featured in this magazine. 1) Hi Gary thanks for joining us, tell me how long have you been writing for? I started writing for submissions at the beginning of 2016. One of the items on my bucket list was to have a story published so I thought I would give it a blast. I hadn't put pen to paper since college (and I was 33 at the time) so it was a bit of a gamble. Deadman's Tome was the first to publish me with the story The Way Out a story that was accepted (and subsequently withdrawn) from three other publishers afterwards. I grew up with Roald Dahl, but my current favourite writers are Adam Neville and of course Stephen King, though I'm getting a bit fed up of seeing his adaptations on TV now and I thought Sleeping Beauties was crap. I've met Joe Hill a number of times, but I think he's best when writing short stories. 3) What drew you to the dark side? Was there a particular horror book you read or a film you saw that started off your love of horror? My grandad Buller died in 2001 but he was a fan of true ghost stories and used to entertain me with spooky tales, I think that's where my interest started. My parents bought me my first horror book when I was about ten and it was an illustrated edition of Poe. The Telltale Hart scared the heck out of me, but at the same time I loved it. I read IT, Misery and The Amityville Horror when I was about twelve years old, far too young, but my neighbour at the time gave them to me when they moved out. I've put the brakes on my submissions a bit. There are stories out there from the early days that I'm not one hundred percent happy with. It used to be a bit of a target to get a story published a month. There are publications out there that take any story - no matter how poor, and in my case they did! Now however, I want to make sure my stories are spot on before submitting and I'm aiming higher. I've got a story out in Aphotic Realm: Banished and also a story coming out in Unnerving Magazine, which I'm very excited about. 5) If you had the choice as coming back in your next life as a supernatural creature who would you be? I used to be terrified of the idea of death, but watching my mum pass from cancer this year has somehow made me feel better about it. She was only 55 years old and a lovely woman. I'm sure in some capacity she's watching over us. I've no interest in coming back as a supernatural creature but I'd like to quietly watch over my daughters and make sure my family is OK. That would be more than enough for me. Gary Buller is an author from Manchester, England where he lives with his long suffering partner Lisa, his daughters and dog Chico. He grew up in the Peak District where the hauntingly beautiful landscapes inspired him to write. He is a fan of all things macabre and loves a tale with a twist. 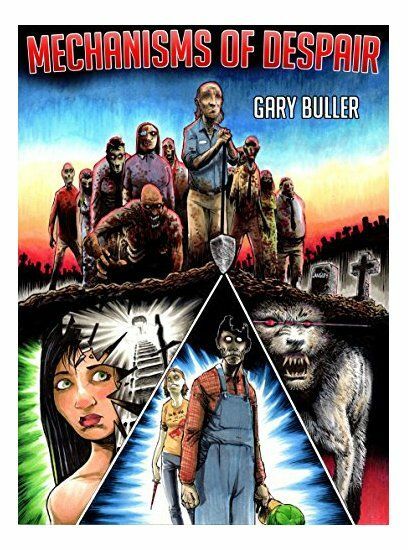 He is a member of the Horror Writers Association. His debut collection of short stories, Mechanisms of Despair is out now and is really epic! All proceeds from this amazing collection are going to two great causes, The Alzheimer's Foundation in the U.S.A and to Sarcoma UK - a charity that helps people suffering with bone and soft tissue cancer like his mum.